The National Lottery results are to be broadcast on ITV for the first time after more than two decades on the BBC. 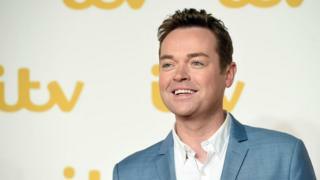 Stephen Mulhern will host the first new-look show. It will last 90 seconds and will be shown during the ad break of Saturday's Britain's Got Talent.It's a return to primetime TV for the Lottery results, which switched from BBC One to the BBC iPlayer in 2017.Camelot said a range of "well-known ITV personalities" would join Mulhern in future editions.The draw itself won't be broadcast on ITV, but will be available on the National Lottery's YouTube channel. Camelot said the show would have "different formats throughout the course of the year". Mulhern said "all will be revealed" in the first ad break of Britain's Got Talent at 20:15 BST. He also hosts spin-off show Britain's Got More Talent.Camelot said they wanted to make the National Lottery "more relevant and visible". Hayley Stringfellow, its head of brand marketing, said: "People play The National Lottery to win life-changing prizes, but they sometimes forget that they also raise around ?30m every week for UK good causes. "This partnership will deliver a range of exciting and engaging ways to shine a light on the difference National Lottery players make to the UK." Camelot added that there would be "a range of innovative wraparound concepts" highlighting the causes that benefit from National Lottery funding around the UK. Results will still be read out on BBC One four nights a week. The live results show had been on BBC One from the first draw in 1994 until last year.